Everything started out so smoothly – the warm sun and the cool breeze creating the most pleasant of conditions. It’s funny what a few hours can do, though. By the afternoon, I was wondering if we would make it back alive. When you hear the man looking after you mutter, “that’s not supposed to happen”, you start to worry. 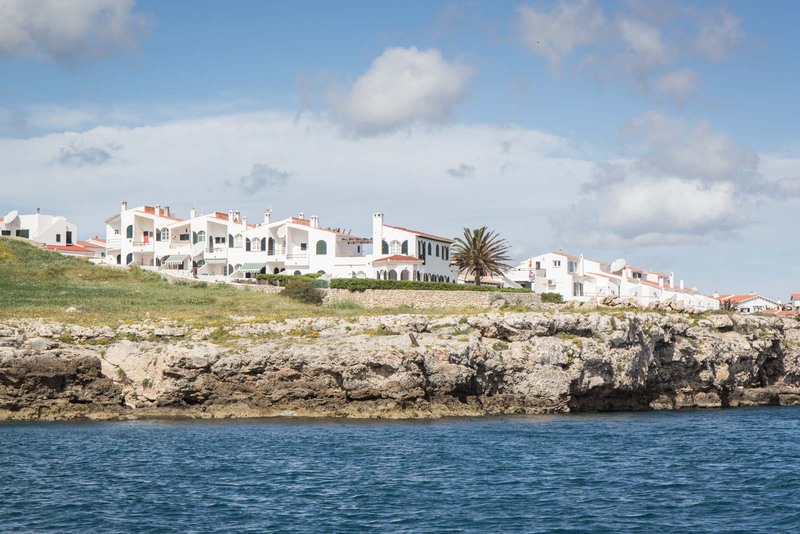 This is a tale from Menorca – the Spanish island in the Balearic Sea that is lesser known than either Ibiza or Mallorca but I believe offers a much more authentic holiday experience. 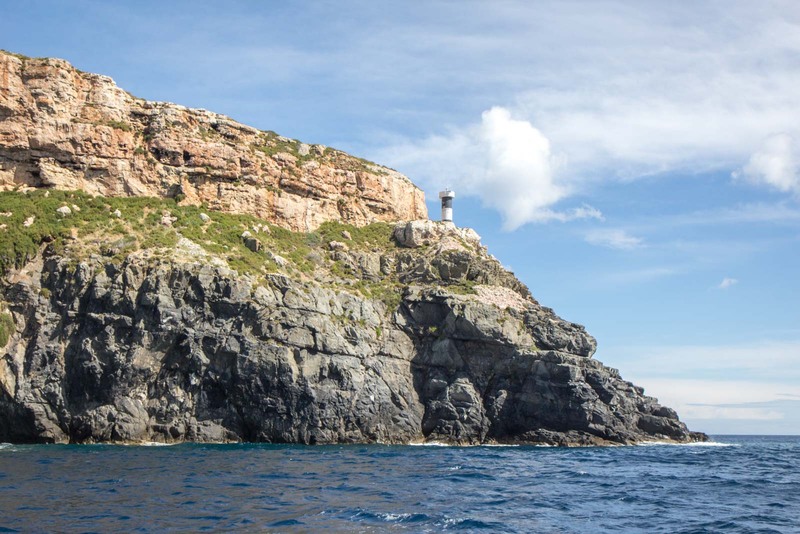 One of the best elements of Menorca is the natural activities available and, on this particular day, I was setting out on a yacht to do some sailing along the coast. At the dock at Mahon harbour I met the captain – let’s call him El Capitano for the sake of this story. We shook hands as he introduced himself to me and my two other sailing companions. The three of us would be his crew, he told us. Up until this point, I was thinking that maybe it would be more like a cruise ship and that, if I really needed to work, I could offer my services as the onboard entertainment. It turned out I would be pulling ropes instead. Under motor power, we made our way out of the harbour. The houses here come down to the shore on both sides and, in little inlets, there are clusters of restaurants and shops. Although there are some larger hotels on the cliffs, nothing is overly developed in the way you might expect in a popular tourist destination. Once we were out of the heads of the harbour and we turned north along the shoreline, there were hardly any buildings to see. 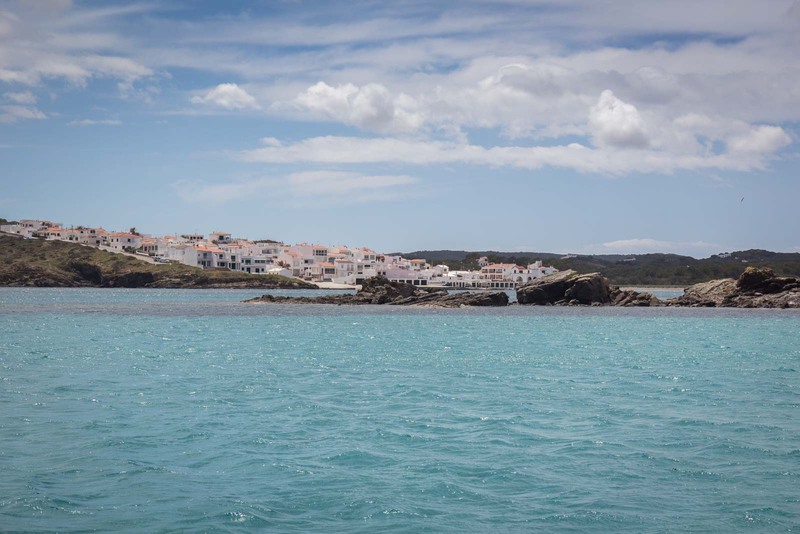 Menorca only has a population of less than 100,000 people and most of those people are concentrated in the main cities. Out of the harbour, it was also time to let the sails do their work and we all did our small jobs to unleash them. It’s a glorious feeling to be actually sailing. 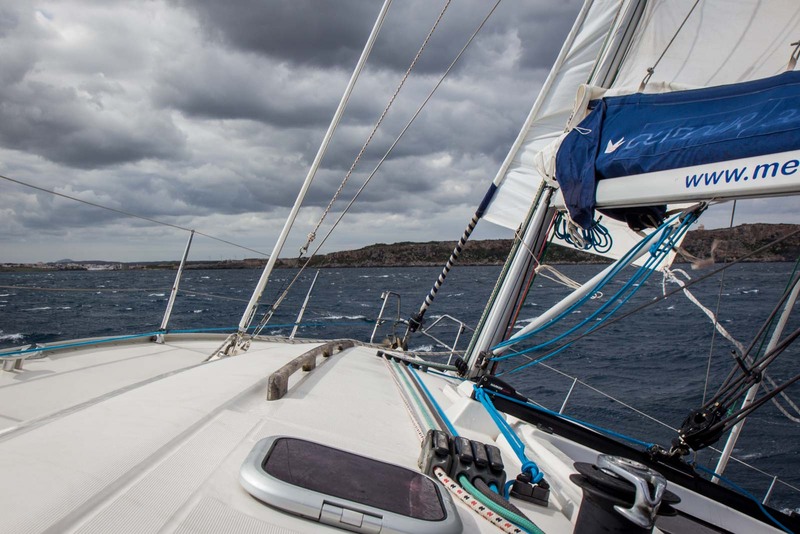 The strength of the wind makes you feel oddly comfortable because it brings a sturdiness to the vessel. This is what it was designed to do and I settled back onto the bench near El Capitano’s wheel and enjoyed the scenery, the birds soaring overhead, the salty air and even the occasional cooling splash of water in my face. 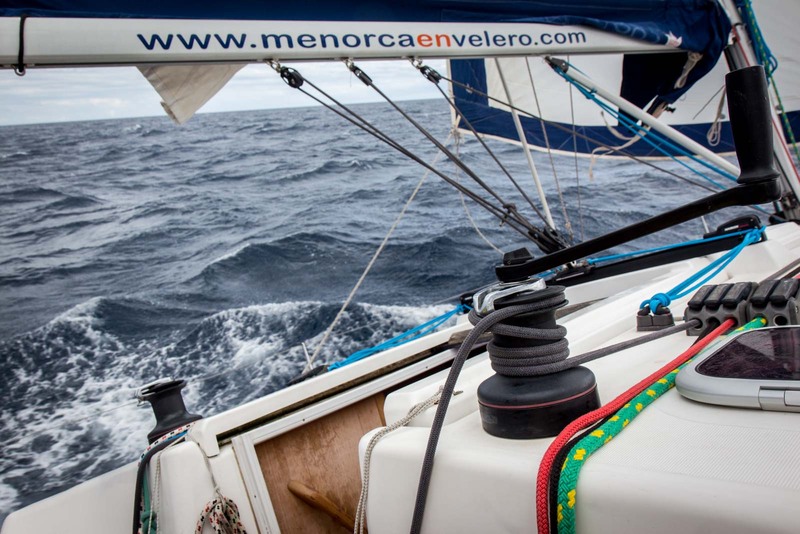 We stopped a couple of times as we headed along the edge of Menorca. It was not peak season for this visit and there was still a bit of a chill left over from winter. That meant I wasn’t too keen to jump in the water but, normally, these little bays where we dropped anchor would have been lovely for swimming or snorkelling. Instead, we sat on the deck for drinks and nibbles – also a lovely way to spend the time. When we stopped for lunch, the blue sky was starting to disappear. Perhaps this is the point where I should have started to worry about the return journey but I was more preoccupied with where we were going to eat if it started raining (downstairs in the cabin, it turned out). El Capitano had prepared a simple and traditional Spanish lunch for us – cold meats, pasta, cheese, and so on. It wasn’t luxury but I didn’t feel like luxury – that’s not what this yacht was about. This felt natural and authentic, like so much of Menorca. If I had wanted to drink champagne on a boat with 20 other people, there would have been a better approach. This was about a more intimate experience that actually allowed you to imagine you owned this boat and El Capitano was a part of your group. He certainly acted that way when it was appropriate and I enjoyed his company for that reason. Even if he did seem unsupportive when I told him I now wanted to own a boat and live on it forever. Then again, any of my friends would probably have given me the same discouraging reaction. 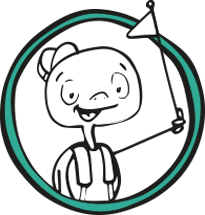 The problem with an authentic and casual experience where you are part of the crew is that you need to take a degree of responsibility when things go south. And that’s exactly what happened as we literally went south, back towards the harbour at Mahon. The blue skies that had turned grey during lunch were now getting closer to a menacing shade of black. The wind was getting much stronger too and the waves were reacting to that by rising up, higher than I felt comfortable with. El Capitano focused on his task and we all focused on him. Until the yacht suddenly lurched to one side. 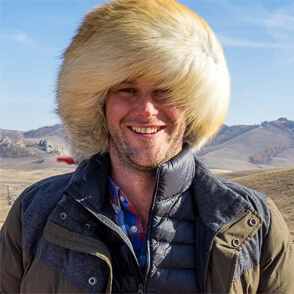 It was the wind that did it, I think. The strength of it coming at a certain angle pushed the boat in such a way that it was suddenly at an angle of at least 40 degrees (although it felt closer to 90 degrees). I grabbed onto a rail and pushed my feet to stand up on the side of the table which I had been knocking my knees against just moments earlier. In my head I knew that this is what boats are designed to do but my face must have shown something different. 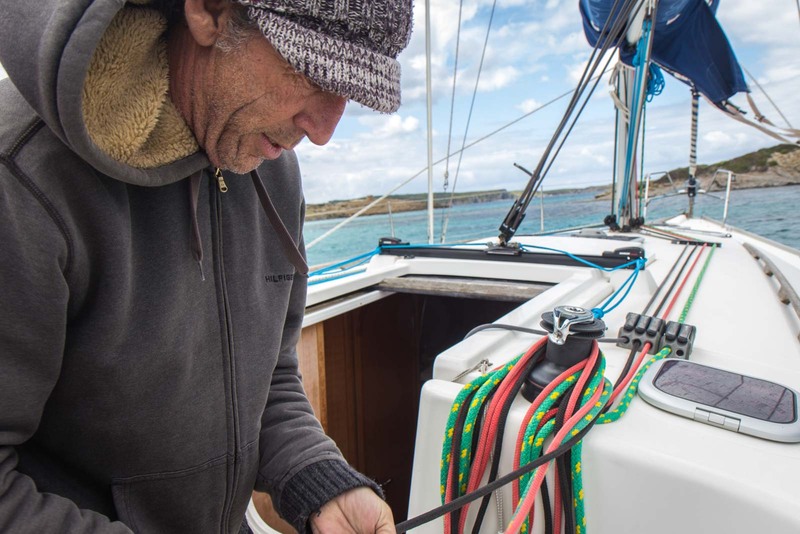 El Capitano assured us that everything was fine and there was no way the yacht could capsize – it would need to lose its keel for that to happen and that was almost impossible in these kind of conditions. Still, I felt my heart beating faster and my grip tightening on the rail. For the next hour – or was it just 30 minutes – this scenario repeated itself as the wind would pick up and then die off slightly before coming back with even more fury. We all pulled ropes and turned winch handles and took turns at holding the main wheel when something else on the boat needed the boss’s attention. 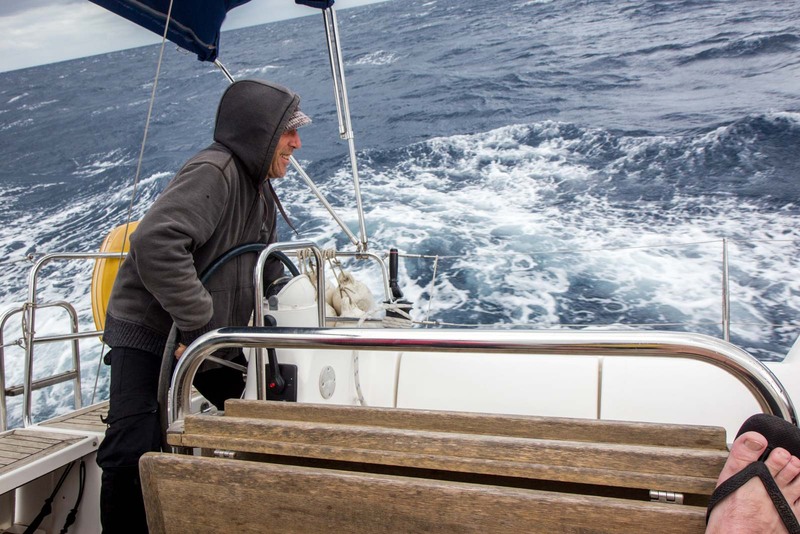 El Capitano told us stories about crossing the Atlantic in a yacht. Perhaps it was supposed to make us feel better in comparison but I wasn’t overly comforted by one tale about him falling off the back at night and only surviving because he happened to grab a rope on the way overboard. And then we were back. Through the heads of the harbour and the wind disappeared the waves receded. The grey skies above were the only evidence of what we had just experienced. I laughed – perhaps with relief or perhaps with exhilaration. It was the kind of adrenaline that comes from finishing a scary abseil – where it’s partly about the safety and partly about the accomplishment. Within minutes of being in the harbour, I was already viewing our journey back as a fun adventure. Ultimately, I guess that’s the point. The kind of weather we had is quite rare – even more unlikely during the summer months when most tourists are here. The usual experience out on a yacht like this in Menorca would be a leisurely cruise along the coast with stops for swimming, lunch on the deck, and a few drinks. But every trip is organic and natural and that’s the charm. It’s about living the life on the sea for a day. I have changed my mind about buying a boat, though. El Capitano turned out to be right about that. As long as you are happy with the different places you are exploring, Eva, that’s all that’s important. Seeing new things – wherever they are – is one of the greatest joys in life! 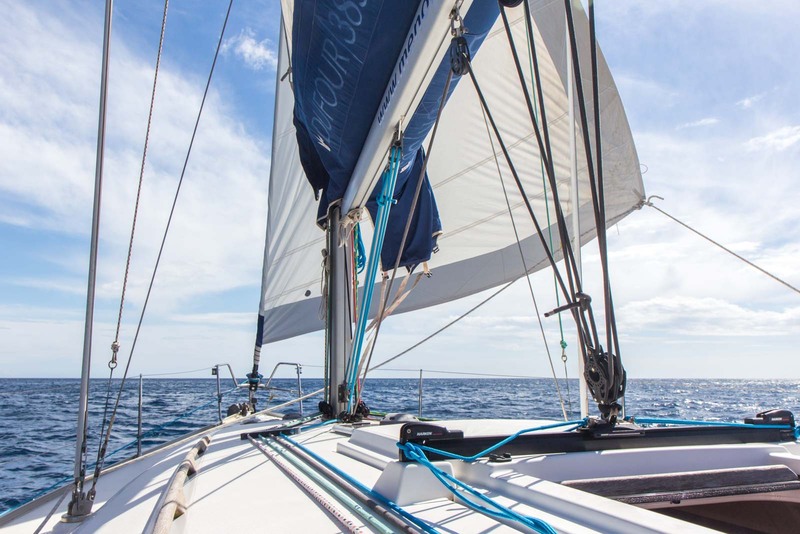 Sailing in the Mediterranean is a dream of mine and reading this article has given me even itchier feet! A truly beautiful place. Well, this is a very easy way to do a bit of sailing. 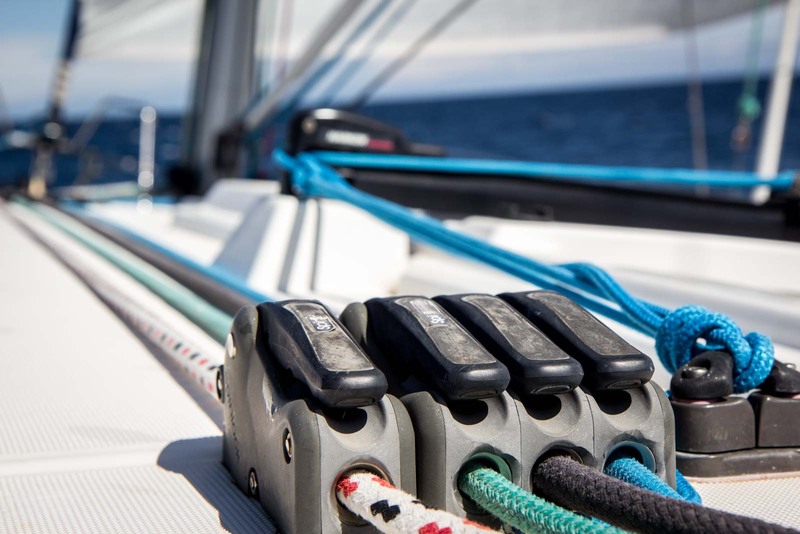 You’ll have an experienced captain and you can be as involved as you want in the actual sailing process. If you click the link at the end of the article, you’ll see they offer one day trips but also longer ones that you could do with a group of family or friends. What a great experience. Though I don’t know how useful I would have been when the boat started tipping! As long as you could hang on, that’s all you would need to do!! 🙂 It was a lot of fun, in hindsight! Wonderful…you enjoyed a lot right? It should have been amazing adventure! The pics from the sea are inspiring. Thanks. I love the way the pictures show the sea when it’s sunny and calm – and when the storm comes up!! Great pictures – sometimes even bad weather can make for an awesome experience! It can certainly sometimes make for a more interesting experience. Anyone can go snorkelling in the sun – but how many people can say they really felt the strengh of nature!! There’s nothing wrong with going in a speedboat as well. I find sailing to be more calming and it’s not too expensive to just get a ride on one for a day with some other people. But as long as you’re on the water – that’s the important thing!! I had the wind blow up on us on an overnight trip from Alicante to Ibiza. We arrived in the dark and it was scary until we got behind a headland and then the wind and waves dropped away. I like the Med because it has always been warm when I’ve been there in the summer months and the gales don’t last too long. No, they don’t last too long. But it’s not what you expect from that part of the world. I think it’s normally so calm and warm around these islands. Really love the light house picture, i can only imagine that adventure you guys had, so lucky! Thanks. The lighthouse is really pretty, isn’t it? I love to do adventurous things in life. Sailing a yacht in summer is really a lovely experience but at the same time it is an hilarious act as well. Sounds like a wonderful jounrey! I love boat rides and other offbeat modes of transport like that. Those are planning to go sailing this summer take lots of sunscreen, a hat, and loose clothing. There is no hiding from the sun when you’re out on the water.